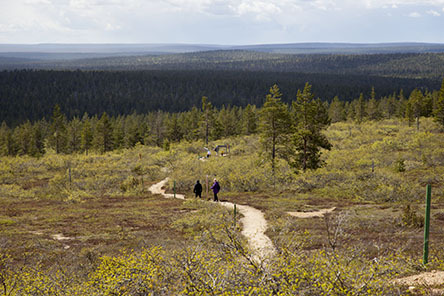 The Urho Kekkonen National Park was founded in 1983. It is the second largest national park in Finland. This vast park extends eastwards from the resort of Saariselkä through the wilderness of Finnish Lapland and all the way to the Russian border. 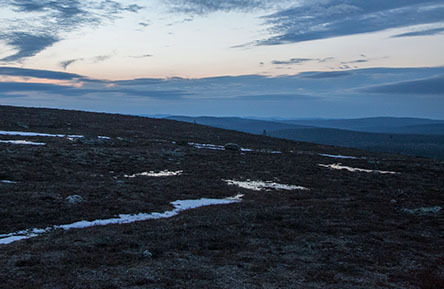 The expansive fell highland region and dense forests of the Urho Kekkonen National Park allow you to experience our northern nature in all its glory. The park provides a variety of opportunities for day trips as well as being an outstanding setting for traditional wilderness hiking. Information and maps: Saariselkä Customer Service Point Kiehinen Kelotie 1 / Siula, FI-99830 Saariselkä | Tel. +358 40 168 7838 | tourist.info@saariselka.fi Open daily 10 a.m. – 5 p.m.
At first glance, visitors see the beautiful scenery of the Luulampi lake district. Two small lakes with sparkling clear water and bubbling natural springs glimmer at the foot of the fell. In some places the lakes are lined with sand, while others parts have a thin cover of ground vegetation. 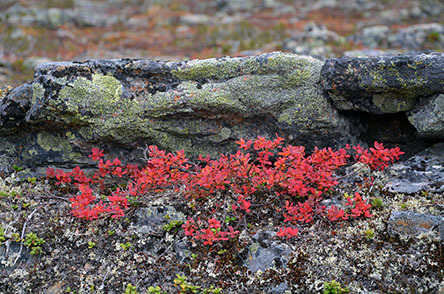 Lingonberry, crowberry, heather and various lichens cover the hilly landscape. Beautiful! Nevertheless, beauty was probably not the reason why people settled in this environment back in ancient times. The hilly landscape was favourable for hunting wild reindeer, which is probably why people set up home by the lakes. Indeed, it was probably the same people who dug a series of trapping pits located a couple of kilometres from the lakes. Hunting wild reindeer was an important livelihood or means of survival. The sites of former deer trapping pits are still evident on the northern side of Luuvaara, running along the Roopenoja Stream. People not only hunted wild reindeer, but also other game, while fishing and gathering nature’s bounty were important parts of people’s livelihood. The ancient bones found in the area are those of large mammals. This suggests that elk and wild reindeer were hunted back in times gone by. There are still elk in the region, but there is no longer a wild reindeer population. The trapping pit was an effective hunting method and the last time wild reindeer were seen in today’s Urho Kekkonen National Park area was back in the late nineteenth century. This marked the end of an ancient hunting tradition that spanned millennia. Luulampi and its surroundings are a tribute to these bygone days. The first settlers may have arrived at the site fairly soon after the end of the Ice Age, 9,500 years ago. Once the land was free from ice and fit for settlers, people settled on favourable spots close to water. People were semi-nomadic, moving from one residence to another, according to the seasons, and returning to favourable locations time and again. 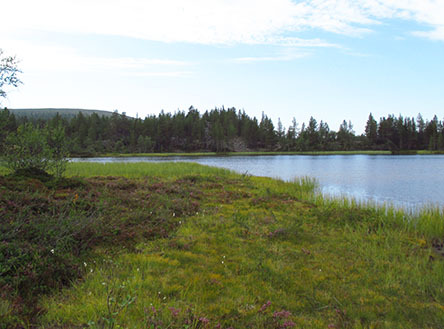 Signs of prehistoric dwelling sites in Luulampi can therefore be dated back across millennia. Lapland’s extreme climate and fell highlands have a major influence on the annual natural cycle. Everything blossoms quickly – generous amounts of thaw water in early summer, followed by warmth and possible drought in midsummer, combine to ensure an incredibly fast transition from spring to summer and a somewhat lingering feeling around midsummer. The thaw water from melting snow rumbles loudly and forcefully in springs in the creeks and slopes of the Iisakkipää Fell. The water rushes down the slopes towards River Luttojoki, watering the ground along its way for the imminent growing season. The first flowers start to blossom along the stream, while snow lingers higher up the slopes. 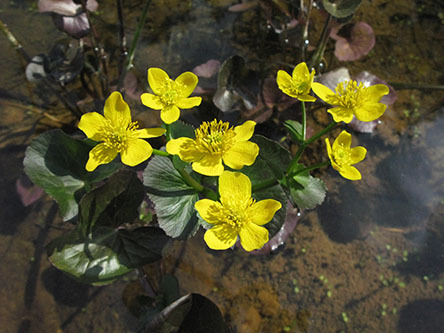 The sunny yellow flowers of marsh-marigolds (Caltha palustris) glow along the streams. The rugged slopes of Iisakkipää Fell are covered in snow until May–June. 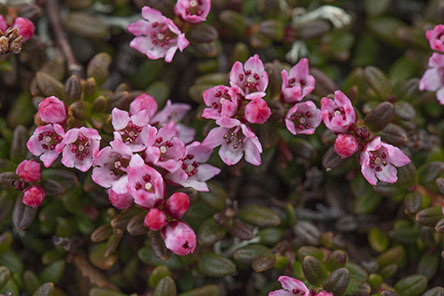 Crowberry (Empetrum nigrum) is the dominant species on the barren pine-dominated heaths of the lower slopes. Occasionally, lingonberries (Vaccinium vitis-idaea) and bilberries (Vaccinium myrtillus) can be found. Crooked birch trees become more common in the forest higher up the slopes. Butterwort (Pinguicula vulgaris) and wood cranesbill (Geranium sylvaticum) grow here and there in moist depressions and along brooks. The ground layer is rugged beneath the mountain birches and the birch forest looks more like shrubbery, a couple of metres in height, than a mountain birch forest. The birch stand thins out the higher you go and does not offer much protection against the elements. The wind blows freely through the birch trees and, at the height of summer, the sunshine feels hot due to the lack of shade. The species growing in the fell highlands are champions of survival in extreme conditions. Summertime can bring strong winds and heavy rains, as well as scorching sun and drought. Wintertime, however, offers a protective blanket of snow that can be very thin if there are strong winds. Fell highland species are small in size, but reward viewers who are willing to bend down and take a closer look. Viewed up close, the beauty and fine details of this flowering species rival any showy garden species. The early summer flowering season is over in an instant. Nature begins preparing for autumn already during early August – the ripening of berries and mushrooms confirm that summer is ending. In pine forests on the lower slopes, it pays to keep your eyes open, as you can spot various species of mushrooms. Penny bun (Boletus edulis), matsutake (Tricholoma matsutake) and the more common orange birch bolete (Leccinum versipelle, L.vulpinum) can occasionally be found for the pleasure of gourmets. If you are lucky, you may even find chanterelles (Cantharellus cibarius) in the lush mountain birch forests. The autumn foliage decorates the landscape in vibrant autumnal colours. 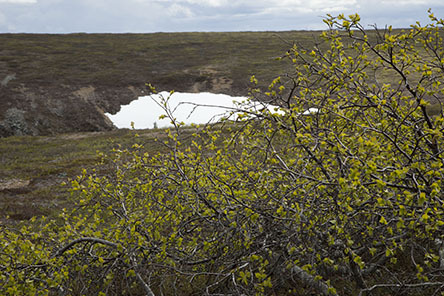 In wet places lower down the slope, the bog bilberry (Vaccinium uliginosum) adds colour to the greenery alongside the occasional bilberry (Vaccinium myrtillus) shrub. Mountain birches add a splash of joyful yellow to the landscape, and the leaves of black bearberry (Arctostaphylos alpina) shrubs glow red high up on the fells. Mire patches glow in yellow and orange hues. However, the autumn blaze of colour is a display that will not last long. Nature prepares itself for winter in August and September. After September, the splendid colours of autumn have almost faded away. Nature begins preparing for winter. Snow covers the slopes of the Iisakkipää Fell for six to eight months, depending on the direction the slope is facing. 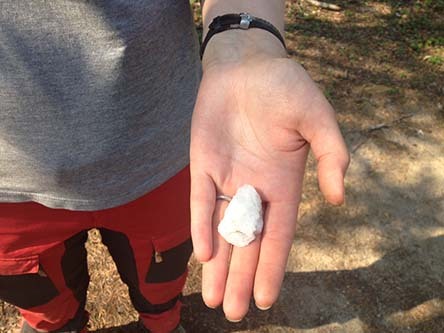 The exposed sunny southern slopes thaw first, but snow can still be found on the northern slopes even in June. In winter, nature rests and tries to make it through to the next growing season with minimal damage. 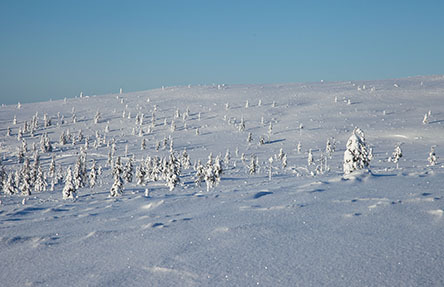 The snow cover protects both plants and animals from harsh wind and frost.